All your Clubhouse pals are bringing their animal friends to get spruced up for Pluto’s All-Star Pet Show. With so many pets to bathe, groom and train, Minnie needs help. Luckily, Mickey and the gang are there to lend a hand. But when three adorable little kittens go missing, it will take the right Mouseketools – and help from YOU - to find them in time for the big show. With over two hours of song-filled pet-themed fun, including 4 additional episodes,Minnie’s Pet Salon is the “purr-fect” gift. This latest DVD from Mickey Mouse Clubhouse was great to review. My youngest is 10 months old and she absolutely loves watching anything with both Minnie and Mickey, so I wasn't surprised when we put the DVD on that she'd be glued to the screen. 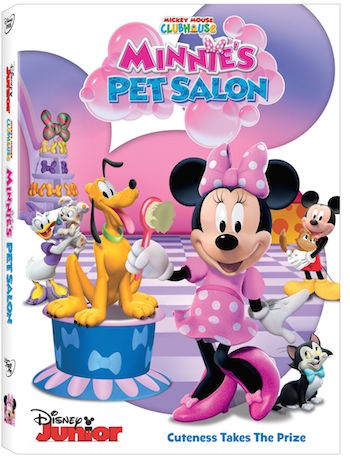 The DVD comes with the full length adventure of Minnie's Pet Salon and with four other episodes from the Mickey Mouse Clubhouse. Filled with our favorite Disney characters along with some catchy songs, this DVD is sure to be a hit for your little one. It even comes with a Pet Comb, which my oldest who is ten, snatched up to use for herself, lol. This is a great gift for anyone with little ones who are a fan of the Mickey Mouse Clubhouse and is now available in stores on DVD. Disclosure: All opinions are my own. I received Minnie's Pet Salon on DVD at no cost for the purpose of this review. No other compensation was received.